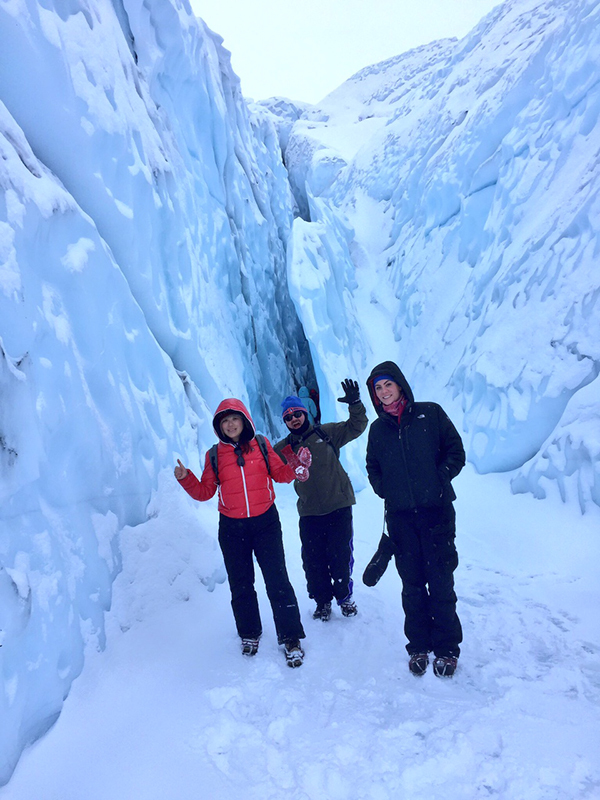 Matanuska Glacier trekking in the winter is an amazing experience. This week, Anchorage hosted a 700-person conference of tour operators called Go West, and as part of the convention, Southcentral Alaska was abuzz with activity, as operators wanted to experience Alaska in the winter. And it didn&apos;t disappoint! All told, it was a week filled with amazing Mat-Su Valley adventures - an ideal itinerary for someone looking to visit in the winter. Starting off in Talkeetna, the gateway to Denali, was flightseeing, a brewery tour, fantastic breakfast at Talkeetna Roadhouse and a nice stay at the Talkeetna Alaskan Lodge. Hatcher Pass afforded great opportunities for fat tire biking, sledding and snowshoeing around Independence Mine, followed by an excellent dinner at Turkey Red in Palmer and a stay at the charming Colony Inn, which used to be a teacher&apos;s dormitory during the Matanuska Colonist project. Many people trek on Matanuska Glacier in the summer, but we did it in the winter, and it was nothing short of fantastic. It was amazing to literally walk inside a glacier. Then, it was time for ice fishing on Finger Lake with Ehamnn Outdoors. Many of the guests had never been on a frozen lake before, so ice fishing was a completely foreign experience. After some time because it was less crowded than the summer months, there was ample time to explore ice caves and much more. If you haven&apos;t been to the glacier in the winter, it&apos;s definitely a must-do. Due to the tricks and nuances from the experts, we ended up catching a fish, bringing squeals of delight from the anglers. We culminated the fun-filled week with a stop at the Palmer Musk Ox Farm (which is only open by appointment in the winter months) to visit the prehistoric animals and learn about the production of qiviut. People associate Alaska as a summer-only destination, but that is far from the truth, as the last week proved to be filled with adventures around every corner. Add on the start of the Iron Dog snowmobile race, the upcoming Iditarod Trail Invitational and the start of the Iditarod, and you have the recipe for fun and excitement in the Mat-Su Valley in the winter months.